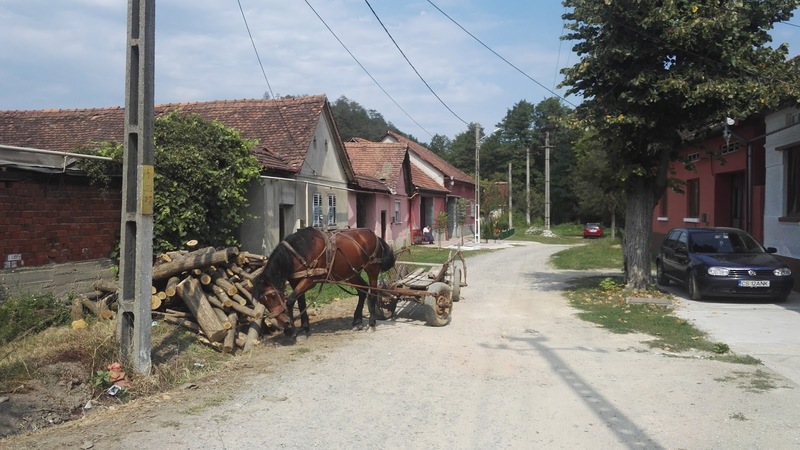 My next rest day in Romania took place in Brad, where gold mining took place in former times. Now there is a "Gold Museum" that unfortunately was a bit disappointing. It contained hundreds of geological specimens but no explanation in English. 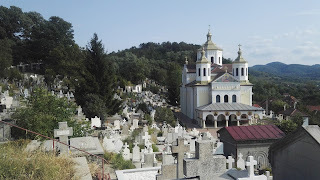 I found Brad's huge cemetary and Romanian-orthodox church far more interesting! Still I liked Brad a lot because I had a fantastic hotel where my torn feet could heal. I had not washed my socks in a long time and the crusty dirt had rubbed the skin on my feet! Best of all a Lidl supermarket was located right next to my hotel which meant I did not eat in any restaurant but cooked in my hotel. Many Romanian hotels are converted normal houses which means that there is a common kitchen area. I was now hiking in Siebenbürgen, where Germans and Austrian minorities have settled since the Middle Ages. Many villages still have German names. Most ethnic Germans though have left after the wall had come down. Very few still live here and they are getting older and older. But that is true in the entire countryside where mostly old people are left. Wherever I went I was asked: "Singura"? - Are you on your own? I ended up hating that question because I was asked it dozens of times - and could not really answer because nobody spoke English or German! The route took me through agricultural country where I sometimes felt like 50 years ago. 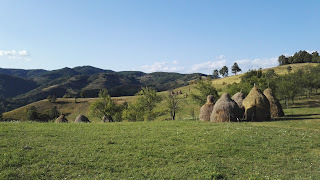 Now in the height of summer, hay was cut and dried on these wooden constructions. Cows, horses and sheep were grazing everywhere. 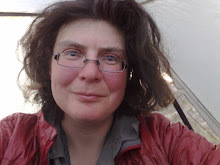 Cows and horses were no problem - but sheep were herded by aggressive dogs which attacked me as soon as the discovered me. Most of them were in a real bad state, half-starved and with an incredibly dirty fur. Unfortunately they were not well trained either and would hardly listen to the shepherd's commands. But although were loud and aggressive no dog tried to really bite me. 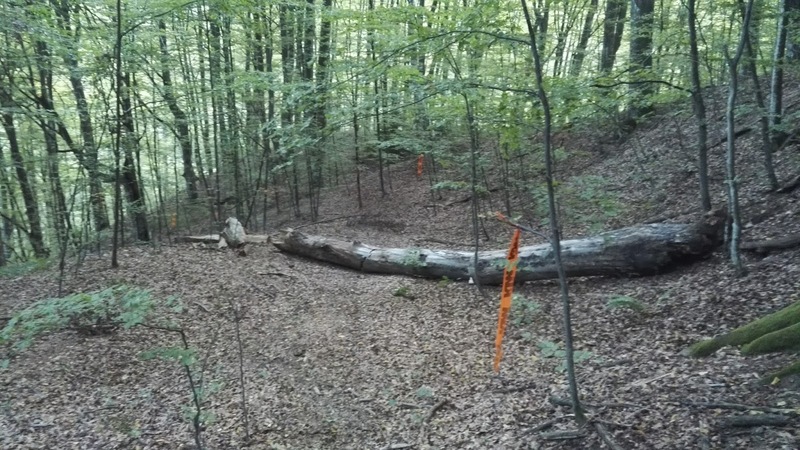 Finally I reached the area were the "Siebenbürgische Karpatenverein" had just recently waymarked and maintained the trail. Brand new blazes, cut-off trees branches and freshly mowed grass meant fantastic hiking conditions. I just wonder how long this will last. 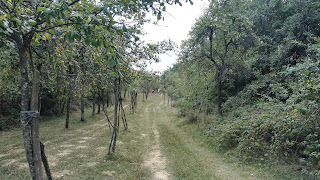 If the grass and undergrowth is nut cut every year, next hikers will basically be bushwhacking! 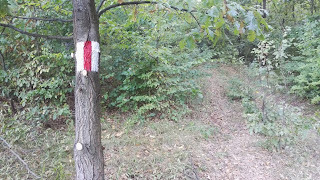 The new trail marking stopped soon but with the help of my GPS I had little problem continuing on trail. 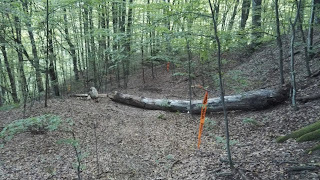 My luck stopped at Bautar where the hiking association had relocated the trail to in order to avoid a major road walk and some property issues. As soon as I crossed the highway at Bautar the marking stopped completely. It was a bad foreboding when I was refused water for the first time in my entire hiking life. I had asked an old lady at a farmhouse for water and she just chased me away. It turned out not to be a problem because the trail followed a stream for quite a while. 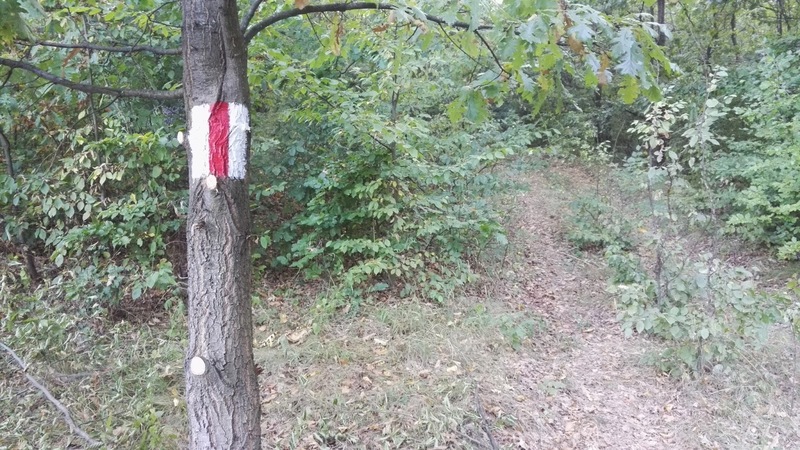 There was no marking and no real trail but red ribbons seemed to flag the route. Shortly before sunset the flagging stopped. 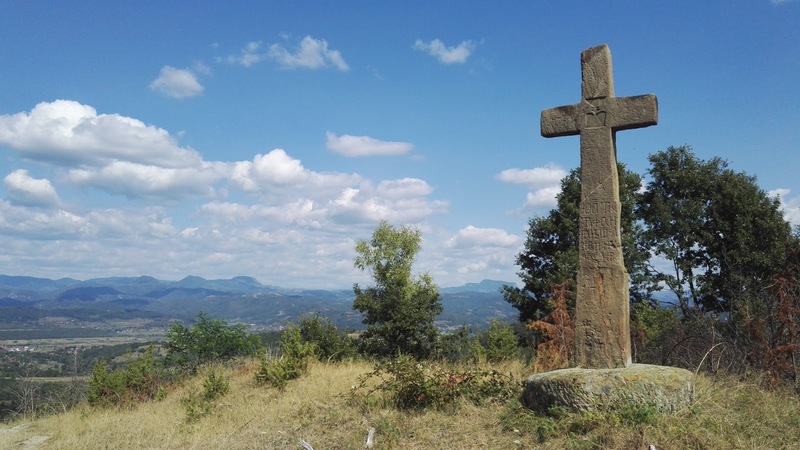 In Gimboca I bought some last refreshments and started the half day walk to Caransebes. The old route was not bad and took me through some typical Romanian villages where horse carts are parked next to cars. The whole area is known for fruit plantations and right now the plum harvest was in full swing. My pension in Caransebes was run by an ex-Austrian guestworker and it was interesting to hear a Viennese accent in Romania ... I just had a brief stopover in Caransebes because next morning I took the bus to Timisoara - my last long rest stop in Romania. Timisoara turned out to be a fantastic place and it is no wonder that the city will be European cultural capitol in 2021. I took a free guided city tour and learnt a lot, especially that in this town the Romanian revolution started in 1989. You can still see houses with bullet holes from that period! I loved the Art Museum that showed a fascinating modern art exhibition. But besides sightseeing I had to solve some practical problems like buying new gas canisters. Unfortunately my smartphone was not charging properly any more and I diagnosed that this was the powerbank's fault. But buying a new powerbank turned out to be a big problem despite the fact that one of Eastern Europe's biggest shopping malls is located in Timisoara. 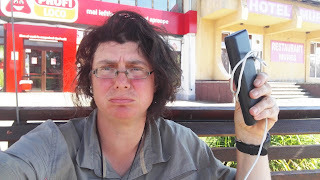 It was impossible to find a powerbank big enough to recharge my phone five or six times and I had to settle for a smaller and cheaper version before taking the bus back to Caransebes and the trail.